tomato puree (water, tomato paste), water, sun-dried tomatoes (contains sulfites), basil, soybean oil, onions, garlic, red bell peppers, parmesan cheese (part skim milk, cheese cultures, salt, enzymes), olive oil, romano cheese (cow’s milk, cheese cultures, salt, enzymes), salt, red wine vinegar, dehydrated onions, sugar, citric acid, natural flavors (contains soy). 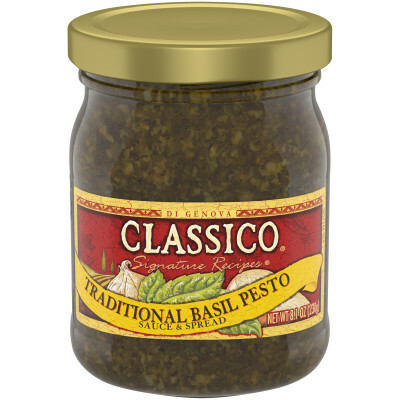 Basil pesto and the intense flavor of sun-dried tomatoes combine in this savory topping. Spread on a loaf of Italian bread. Or add to pasta with olives and crushed red peppers for the easy-life version of Puttanesca. I order this by the case from Wal-Mart and love it. 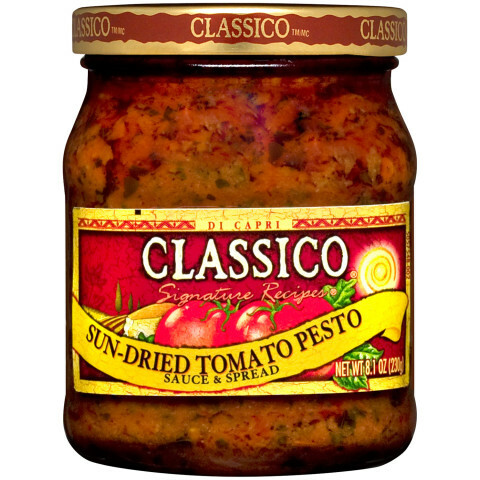 I use it for a pasta sauce, seasoning for chicken and fish and as an appetizer on toast or homemade crackers. It will also turn a boring cup of cottage cheese into a treat. I keep meaning to try the other varieties but keep gravitating back to the Sun dried tomato recipe. I use Sun-dried Tomato Pesto on Linguine. I pan sear spicy sausages, saute mushrooms and onions and garlic, add sun-dried tomato pesto and linguine with a couple tablespoons of pasta water. When the sauce bubbles, I toss in baby spinach and sliced fresh basil. Serve immediately with grated parm on top. Love this sauce, I use it on portobello mushrooms with Parmesan cheese and bake it, I usually do this for company and everyone loves it.